August 29, 2011 by Ken Ward Jr. There were a couple of interesting coal-related commentaries in the West Virginia and Kentucky papers over the weekend that are worth a look and some brief discussion. The national audience for this prime-time show can be forgiven if they still wondered at the end of the feature what this struggle of brave coal miners fighting and dying on Blair Mountain was, and why this has any relevance today. Instead, host Soledad O’Brien and the producers of the feature presented something that would more properly be titled, “Stopping Mountaintop Removal Costs Coal Jobs.” Using the decades-old industry excuse for destroying communities and mountains of “environmentalists versus jobs,” CNN insulted the people of the coalfields of Appalachia. They pitted the logic of stopping this incredibly destructive mining practice of mountaintop removal against the emotional plea of a family who would lose a job, and who had no concern at all for impacts on their neighbors and their mountains. 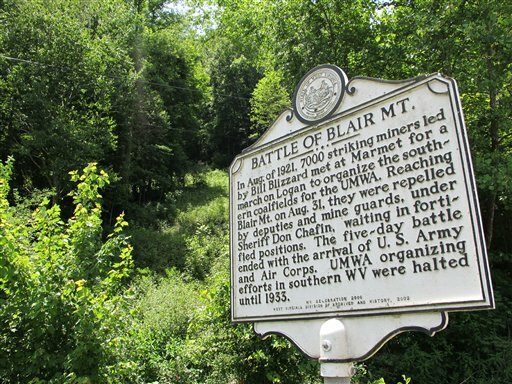 The actual “Battle ‘for’ Blair Mountain” is a fascinating story that has little to do with environmentalists or jobs. It begins with the original 1921 battle itself, and the reasons the coal miners were eager to lay their lives on the line. West Virginia coal companies, unlike companies in Illinois and other nearby states, hated unions. The reason? You guessed it — cutting corners on safety and labor costs maximizes profits. That’s balderdash. At least 97 percent of scientists who regularly publish peer-reviewed climate research believe the earth is warming and that human activities are a contributing factor. The only real debates are over how much, and the likely timeline for future warming. There is no proof that climate scientists have manipulated data to get more money for research, or to prove the earth is warming. The much-ballyhooed “climategate” involving some top climate scientists was based on emails that “show they stonewalled skeptics and discussed hiding data — but the messages don’t support claims that the science of global warming was faked,” The Associated Press reported in 2009, based on an evaluation by the director of scientific freedom, responsibility and law at the American Association for the Advancement of Science. A series of official investigations have found likewise. In the most recent, the National Science Foundation announced this month that its inspector general found no misconduct by a leading climate scientist who was the main author of the 2008 study that showed a big, recent spike in Northern Hemisphere temperatures. Another study published this year confirmed those findings. Those lines were balderdash, too. The “powerful opposition” was in the four states as a whole, with 57 percent against mountaintop removal and 20 percent supporting it, but in the main region where mountaintops are being mined and removed, Eastern Kentucky and southern West Virginia, the results were quite different. The poll found that among those who said they were likely to vote in 2012, 57 percent were against mountaintop removal and 20 percent supported it. 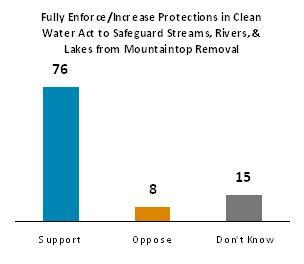 But in the prime mountaintop-removal region, the results were 41 percent in favor and 47 percent opposed. That was within the error margin of plus or minus 7 percentage points for each of those figures. In Eastern Kentucky, more people favored mountaintop mining, and in southern West Virginia, more people opposed it, but the smaller sample sizes meant there was no clear advantage in those results, either. Those results in the narrow parts of the region where mountaintop removal is performed aren’t necessarily that surprising in some ways, but Al’s right in pointing them out and the rest of us in the media should have looked more closely and done so as well. But the poll was probably skewed by a flawed description of the practice, which said coal companies “mine coal from mountains through a process called mountaintop removal mining, where the top of a mountain is removed to extract the coal, and waste is disposed in nearby valleys and streams.” Boiled down, that says waste is put into streams, creating a mental image of unwholesome substances being dumped into creeks and rivers. That is not quite what happens. Small headwater steams, often wet-weather or intermittent, are covered by valley fills made of the rock and dirt mined from the mountains, and the drainage from the fills sends pollution downstream. Given the strong emerging scientific consensus about mountaintop removal and its pervasive and irreversible impacts on the environment, the question was probably worded about a neutrally as one could expect. And regardless, you’ve got to give the citizen groups and their pollster credit for publicly releasing massive details on this survey, unlike most other polls done by special interest groups. Regular readers of Coal Tattoo know that my friends in the environmental community often get upset when I point out errors of fact or exaggerations in their public statements, their blogs, and their other media outreach. Their feeling seems to be that they’re on what they believe is “the right side,” and it shouldn’t matter if they get a number wrong here or there or inflate things to help make their point. It’s maddening when they do this, because the existing data, numbers and science already give them such strong ammunition. I don’t know why they reach for something more, something that they can’t prove. Some folks hit me with the old line about the media forcing a “false equivalency,” trying to compare massively misleading statements by the coal industry to what they believe are minor errors by the other side. There’s no question that the media — always on alert and fearing charges of being “liberal” — does this. I’m sure I’ve done it myself. Frankly, the comparison here by Al Cross has that ring to it. The science supporting the notion that the world is warming, that this warming is caused by human pollution, and that the impacts of this warming are going to be devastating to our society … well, the science supporting that is simply overwhelming. To not simply question those basic points, but to — as Rick Perry did — blame it all on scientists manipulating data — is just remarkable. On the other hand, the environmental groups simply did what special interest groups do — they touted the more favorable numbers in their poll, didn’t talk about the less favorable ones, and criticized the media when we pointed out some not-so-favorable results. Moreover, this was just one poll. There have only been a few others released publicly on this issue, and each provides only a snapshot-in-time view of public opinion on mountaintop removal. A scientific paper about this poll would likely have been forced through the peer-review process to discuss the unfavorable results, just as good scientists like WVU’s Michael Hendryx go to great lengths to explain the limitations of their work. Honestly, I wish I had included the numbers Al Cross wrote about in my original coverage of the mountaintop removal poll, along with quotes from the pollsters explaining what they think those results mean. I’m glad Al pointed them out, but I it’s hard to buy into the conclusion that not talking up those results is equivalent to dismissing the overwhelming science of global warming. Thanks, Ken, for the shout-out and the constructive criticism. A couple of other folks saw a false equivalency, and while that was the impression I created, that was not my intention. There is certainly a big difference in the message machines. I think what’s lost in Al Cross’s analysis is how remarkable it is that, even in the “heart” of the region where mountaintop removal occurs, a plurality of voters oppose the practice – even if support/opposition is a statistical tie – when support for the practice among politicians is practically unanimous. I think it’s also important to point out, Ken, in regard to your “hidden good news for coal” point, that these counties where mountaintop removal occurs have been losing population at an astounding rate. It’s pretty reasonable to expect that the people moving away had a disproportionately unfavorable view of their mountains and homes being destroyed. For instance, According to data from a recent study on life expectancy in Population Health Metrics, McDowell, Mingo, Logan, Wyoming and Boone counties lost 21.5%, 12.3%, 10.7%, 11.9% and 3% of their population respectively between 1997 and 2007. Any shift toward greater support for mountaintop removal could easily be explained by these trends alone. Finally, on the false equivalency issue — first, thanks for pointing it out. It’s important. But I’m not sure you’ve gone far enough in explaining why it’s such an issue in regard to mountaintop removal. Even if the groups who did the poll could justifiably be criticized for spinning their discussion of the top-line numbers, it’s in an entirely different category from the likes of Cecil Roberts or Sen Manchin talking about “millions of jobs” being at risk from EPA’s more vigorous enforcement of the Clean Water Act in Appalachia. They don’t even provide sources, but appear to simply be making numbers up. And whether it’s 57% or 47% of Central Appalachian residents that oppose mountaintop removal, that hardly turns the truth on its head the way that the narrative about an “EPA assault on Appalachian jobs” does. Several folks have commented on Coal Tattoo that the concern is that as existing permits are mined out, and new permits not issues by the Corps (and OK’d by EPA), that’s when people who are currently working at these surface mining operations will see their current jobs disappear. Isn’t that a reasonable concern for those folks to have? As permits are mined out, and new ones issued, won’t that cause mine operators and their employees some problems? More importantly, I’d like to go back again and ask you if you’ve scoped out a template for what you would consider a “responsible” mining operation, exactly what a permit would look like that you and the groups you work with would not oppose. By the way, while it may be reasonable to assume that people who have moved from those counties didn’t like mountaintop removal, it’s also possible that they moved because they needed to find a job somewhere else — and that we can’t say for sure, without more data, what their view is on the issue. Assuming is a dangerous thing, especially when you’re making assumptions about someone else’s opinions. I hear ya about the danger of making assumptions, Ken, and “reasonable to assume” would have been stated as “possible” in my comment. The point, however, is that a change in polling numbers since 2004 could be explained in any number of ways that have nothing to do with the coal industry successfully changing minds about the alleged virtues of mountaintop removal. But since the number of mining jobs in southern West Virginia has increased substantially over the last decade, I’m pretty sure the “moving to find jobs” hypothesis won’t fly – at least in terms of coal jobs. In regard to the permit approvals question, the entire question is predicated on the assumption that permits are the limiting factor or bottleneck for Central Appalachian coal production. They’re not. The limiting factor is demand for Central Appalachian coal, which is declining fast, even with the upsurge in international demand for met coal. The latest data from EIA show Central Appalachian mines operating at just 69% of capacity. Historically that figure has been in the 80 – 90% range. Until the capacity of permitted and active mines comes back into balance with demand, the simple reality is that jobs created at a new mountaintop removal mine will come at the expense of jobs that would have been created or retained at other mines. There’s simply not enough market share to go around. If that market share is taken up by a mountaintop removal mine at the expense of an underground mine, it would actually cost jobs, not create them. Not that actual logic and data are going to kill the coal industry shibboleth that permits denied equals jobs lost. But for anyone actually interested in creating and preserving jobs rather than bolstering the profits of coal companies, they’d do well to focus on ensuring that it’s the mines that create the most jobs with the best benefits (i.e., underground union mines) that get permitted to meet the declining demand for Central Appalachian coal — while aggressively seeking to diversify the economies of coal-dependent communities. And in regard to “responsible mining practices,” I think I provided a pretty good list the last time you asked the question, but in the context of this discussion, I think “underground” and “union” are the factors that a responsible politician or economic development professional would focus on. Cecil has said that the economic impact of eliminating the American coal industry, when all the ripple effects (which are standard multipliers used by economists) are included, could amount to a million jobs or more, and will affect the lives of millions of people. Because you’re not just talking about the direct coal jobs, you’re talking about the mining equipment jobs. You’re talking about coal truck drivers’ jobs. You’re talking about railroad workers’ jobs. You’re talking about utility workers’ jobs. And then you’re talking about the jobs of all the people who support those “direct” coal, transportation and utility industry jobs — like mechanics, equipment and parts makers and suppliers, etc. And then you’re talking about all the people who derive economic benefit from the wages and benefits paid to all those workers — people who work in grocery stores and pharmacies, restaurants and gas stations, and on and on. And, of course, you’re talking about all their families. — that the UMWA prepared in 2010 as part of our examination of the impact of the EPA’s proposed utility MACT rule, which includes our estimation that the rule would lead to the shutdown of 56 gigawatts of coal-fired electricity generating capacity — or about 19% of all coal-fired power in the U.S. We can debate about whether or not the MACT rule would or would not lead to that level of a hit to the coal industry (the EPA says less, others say more), but for this conversation that is beside the point. What the spreadsheet shows is that if 19% of coal-fired power were eliminated in the U.S., it would lead to a direct loss of 54,000 jobs in in 33 states in the coal, transportation and utility industries. And, using standard Department of Commerce economic multipliers, the total job loss would be in excess of 250,000 jobs. That’s for 19% of the nation’s coal-fired generating capacity. Much simpler math says that if 19% = 250,000 jobs, then 100% = 1.3 million jobs. Maybe my “blue collar” math is too simple (I’m a writer, not a numbers guy), but let’s say I’m off by 20% — it’s still over a million jobs. That’s not something the U.S. economy is prepared to deal with, nor should it. Either way, the point is, as Ken says above, any one of those people whose job is a risk has a very valid and reasonable concern about why that job is at risk and what real alternatives there are for them. I’ve heard plenty of people take the easy path and say a lost coal job in West Virginia will perhaps lead to a new so-called “green job in Arkansas or Colorado, but that new job doesn’t put a single piece of bread on a laid-off West Virginia coal miner’s table. Unfortunately, Harvard, the coal companies in Illinois hate the UMWA now too, for the very same reason those West Virginia companies did years ago. But we’re still fighting for the same things we were then — safer workplaces and just compensation for doing hard, yet rewarding, work. Matt, you posted while I was working on the above post. I appreciate your comments re: union mines being responsible mines. Fair enough, Phil. Attributing Roberts’ “millions of jobs” quote to just Clean Water Act enforcement is not correct and my apologies to Mr. Roberts for distorting his words. That said, whether it’s hundred of thousands or millions of jobs, and whether it has to do with the Clean Water Act, the Clean Air Act or RCRA, my beef is that it’s always a one-sided equation based on the assumption that Btus of coal that don’t get mined will not be replaced with Btus from other sources and that people will just freeze in the dark and go unemployed as a result. In Al Cross’s words that’s balderdash. I appreciate and very much agree that it’s not sufficient from an Appalachian perspective to say coal jobs in Appalachia will be replaced with Green Jobs in Colorado. But from a national perspective, that is exactly the kind of thing that will occur — which is why Roberts’ quote is so deeply misleading. Saying “millions of jobs are at risk” carries a very different connotation than saying “millions of jobs associated with coal could be replaced with millions of jobs associated with other industries in other parts of the country.” Conflating those issues is an epic distortion that bears no comparison to what AMA, Sierra Club and Earthjustice have been accused of. But let’s get back to Appalachia, which is what both you and I are more concerned about. Here, my problem with Roberts’ quote is that he’s assuming the coal industry is stable or growing for the forseeable future, which as anyone paying attention knows is complete “balderdash” as well. A more accurate quote would be “[number with lots of 0s] of jobs associated with coal will be lost several years sooner that they would otherwise be lost to market forces if those jack-booted thugs at the EPA keep trying to fulfill their Congressional and judicial mandates to update rules on air and water pollution.” I recognize that families worried about putting food on the table would prefer 5 more years of well-paid strip mining jobs over 3 more years, but they would be far better served by policies that promoting sustainable jobs in new industries than policies to preserve the economic status quo for a few more years at the expense of peoples’ health, environment and quality of life. Fortunately, what we’re seeing is that mining jobs are increasing even as demand for coal is decreasing. Thanks to the burgeoning demand for met coal, there is no reason that trend can’t continue. As long as EPA stands by its mandate to protect clean water, that’s exactly what will continue to happen and the only real threat is if EPA backs off and we go back to the “race to the bottom” where jobs at underground mines and at union mines are displaced by lower cost mountaintop removal mines that employ far fewer workers. Oh, and kill people, too – which is hardly a secondary consideration. But I’m convinced there’s a lot we can agree on here, Phil. Strong worker safety rules create jobs. So do strong environmental rules. There can be more mining jobs in the short term that pay better and protect workers while our political leaders and entrepreneurs work to attract new industries to the region (and hopefully UMWA works to unionize them). But that’s not what is going to increase Arch and Alpha’s third-quarter earnings report and that’s what this entire controversy is about. There are a lot more parallels to the first Battle of Blair Mountain happening right now than meet they eye, Phil, and divisive and hyperbolic language from UMWA isn’t the way to win the second battle. Matt: All I’ll say is this: Nobody– and I mean nobody — who advocates an end to any or all coal mining has a sound, sensible and proven plan in place to do anything to provide equivalent jobs to those whose jobs you would end. Saying “millions of jobs associated with coal could be replaced with millions of jobs associated with other industries in other parts of the country” still puts no bread on the table of a laid off Boone County coal miner. The national organizations like the Sierra Club and others say they’re for a “just transition,” but just what is that? Others won’t even address the issue because they don’t have a solution and don’t want people to be thinking about that. And this nation’s sad history with respect to employment transitions inspires no confidence. I live in western Pennsylvania when Reagan allowed the steel industry to be destroyed, many parts of it still haven’t recovered. Here’s the vital rub: until someone can demonstrate to that miner in Boone County that a replacement job will be in Boone County, will pay what he’s making now and will provide a secure future for himself and their families, that miner has no incentive to be amenable to suggestions that he should be OK with someone putting his coal mining job at an end. And lastly, I will say this: Indications are that coal production is and will continue to fall in central Appalachia. But most people on this blog seem to think that US coal production begins at the southern Kentucky border and ends somewhere south of Weston, when in there was 126 million tons of coal produced in northern App. in 2009. Indeed, projected coal production in just about every other part of the country is strong. The coal industry is a long way from dying a natural death, even in Central App. It can, and most likely will, continue for many years to come, which is why Cecil says it will be at least stable for the foreseeable future. And I assure you, he is paying attention. When in history has public policy guaranteed anyone a job in exactly the same place they want, making exactly what they make now? While that may be what a UMWA member in Logan County, W.Va., thinks he deserves — is that what nationwide public policy should be based upon? More importantly, is it what global public policy (keeping in mind coal’s major role in global warming) should be based upon? Is Cecil saying coal production in Central Appalachia will be “at least stable for the foreseeable future”? If so, I’d like to see the government or independent projections that support that. I don’t believe anyone on this blog is unaware of coal production in other parts of Appalachian or other parts of the country for that matter. But to folks like Matt, who want to end mountaintop removal, Central App — meaning Southern West Virginia mostly — is the area they have focused on. All the projections I’ve seen show a significant decline between now and the end of this decade in production and jobs here. What public policies does the UMWA propose for Southern West Virginia to help deal with those expected changes? How does the UMW propose making our nation’s record on economic transition better than it has been in the past? I think readers would be interested in the union’s specific proposals here. These are very important issues, and the UMWA is a major player. That goes without saying. So what are the union’s proposals in these areas? I’d be happy to turn over the blog for a guest blog from Cecil Roberts that answers these questions in a more specific fashion than we’ve seen before. That may be the position of a handful of people, but it’s nowhere near the mainstream view, which could be more reasonably characterized as “stop permitting mountaintop removal mines and underground slurry injections immediately, strengthen protections against subsidence impacts of longwall mining, stop building new coal-fired power plants and replace the oldest ones with cleaner technologies as quickly as is feasible given economic and grid-reliability constraints.” I recognize that’s a long way from what the coal industry would like to see happen, but it’s also a long way from stopping all coal mining and throwing thousands of miners out of work tomorrow. In fact, there’s room in that equation (given increasing demand for met coal) for the number of mining jobs to increase or at least to stay stable, even as production inevitably declines. That outcome would be more likely if common ground could be found with unions to ensure that it’s the job-killing and incredibly destructive mountaintop removal mines that are phased out, rather than underground union mines. But how can we find common ground if you’re only willing to debate a straw-man “environmentalist” position that bears little resemblance to the actual position of environmental and community advocacy groups? Would you agree that the Sierra Club is a major — meaning it has lots of members, a fair amount of money (for an environmental group) and is very active on these issues? If so, then how can their campaign called “Beyond Coal” not be considered one that supports stopping the mining and use of coal? That’s what I hear from coal industry officials and miners who feel under siege from the environmental community. That campaign calls coal “an outdated, backward, 19th-century technology,” http://beyondcoal.org/about-the-campaign/ … Sure, later on that site, the Sierra Club says that its goal is to be sure “that the existing fleet of outdated coal plants gets cleaned up or phased out,” but I am not sure that distinction is made in the rhetoric from most of the blogging, protesting, signs, etc., that the campaign uses to get its message out. I realize you don’t speak for the Sierra Club, but surely you are smart enough to put yourself on the other side for a moment and understand what their campaign sounds like to the industry or to a coal miner, aren’t you? How can we find common ground if someone like you isn’t willing to accept that perhaps the rhetoric from your side can lead even the most reasonable coal company executive or miner to wonder what the environmental community is really up to. “What sort of of practices are those? We can start with minimizing surface disturbance and generation of waste (i.e. underground vs surface mining). And, of course, avoiding AMD and subsidence damage is the starting place for anything you might call responsible underground mining practices – not to mention providing adequate ventilation and avoiding dust build-up. Disabling the sniffer on the continuous miner is a definite no-no. When it comes to surface mining, maximizing the use of highwall miners and minimizing the size of strips may cut down on the extraction efficiency, but it cuts way, way down on the environmental impact of the operations. Conducting highwall operations and disposing of spoil on existing abandoned pre-SMCRA mine benches like they do in Tennessee (eliminating a potential hazard in the process), is a thousand times better than creating new greenfield strips and dumping waste into valleys like they do in WV. The environmental community has had a few things to say with more detail on these issues … For example, this Sierra Club report, http://blogs.wvgazette.com/coaltattoo/2009/10/13/mtr-economics-limits-wont-be-the-end-of-the-world/ , discussed a transition to more underground and less (or no) surface mining. And this report commissioned by the Rainforest Action Network has some interesting things to say about what additional steps EPA could have taken on a mining permit that was issued in West Virginia, http://blogs.wvgazette.com/coaltattoo/2010/10/22/the-pine-creek-mine-did-epa-do-all-it-could-do/ . Just as I’d like to see the UMWA provide more detail about what sort of environmental rules it would accept to reduce mining’s impacts on the land, people and climate, I would like to see your group provide some more specifics about what “responsible mining practices” are and how companies might try to achieve them. I’d make the same offer I made to Phil Smith to you — if you would write a “guest blog” with more detail on this subject, I’d be happy to publish it here on Coal Tattoo … maybe if you’d agree to do that, we could get Phil to do the UMWA’s part and we’d have a nice package aimed at finding some middle ground. I will gladly accept that challenge and offer, Ken, though I’d ask for a little time to solicit the opinions of the broader community of which I am only a small part. As you know, I won’t hesitate to share my own opinions, but I think it would be more helpful for your readers to know the degree to which those opinions do or do not reflect those of a broader community. I strongly encourage Phil to accept the challenge/offer as well, and perhaps take the opportunity to solicit a diversity of opinions from rank and file, leadership, and retired members of his union. As I’ve written about before, I just don’t see how either unions or the environmental community can thrive in the post-November, 2010 political environment if we can’t find common ground.